Did you recently receive your new SBI Credit Card? Every cardholder must learn the best ways of using the credit card wisely. Are you a first-time credit card user? Apart from learning the best ways of using the credit card, you must have some additional information for activating the card. Before you use the card, you need to activate it. Credit Card PIN generation will activate the card, and the cardholder can make the transactions after activation. The cardholders need to generate a 4-digit PIN. Keep the PIN confidential as the PIN secures the card from misuse. Entering the correct PIN, you can make the transactions successfully! SBI offers different ways to generate the PIN for the credit card online and offline. Step 1: If you have an online SBI credit card account, you don't even need to visit the ATM for PIN generation. Visit the official website of SBI Credit card and enter the Login credentials to access your online account. Step 2: Once you login to your account, search for the 'My accounts' option from the main menu and select it. The next step is to select the 'Manage PIN' option. Step 3: Now select the card number and click on 'Generate OTP' to continue. You will receive SMS from SBI on your registered mobile number containing the OTP. Step 4: The next step is to enter OTP and a 4-digit PIN of your choice. Re-enter the same pin for confirmation and click on the 'Submit' button. You will receive another SMS from SBI stating information about successful PIN generation for the Credit Card. Visit the SBI ATM center and insert the credit card in the machine slot. The screen will display a menu with different options. 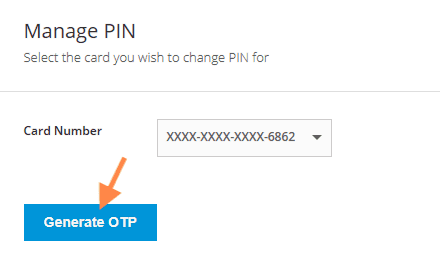 Select 'Create PIN Using OTP' option from the displayed menu. You will receive SMS containing the OTP on your registered mobile number. Enter the OTP to proceed further. The next step is to enter the 4-digit PIN and reenter the same PIN for confirmation. You will receive SMS from SBI stating successful PIN generation for the credit card. Call the toll-free number of SBI customer care helpline from your registered mobile number. After the call gets connected, follow the IVR commands and select the preferred language for communication. You have to select '6' for generating the PIN for the credit card. You also need to provide the date of birth and the credit card details for confirmation. You will receive an SMS on your registered mobile number or at your email ID. Check the SMS or mail to get the OTP and enter the same and follow the IVR response. The last step is to generate the PIN. You will receive a confirmation SMS or mail for generating PIN successfully. You can prefer for any of the options for SBI credit card PIN generation. Generating the PIN will take a few minutes, and you don't need to visit the branch.